Wind River Beauty is the name I’ve given to my current project. I’m using the New York Beauty center (shown below) along with 45° diamond star arms. The overall look is of a Lone Star or Star of Bethlehem variation. In Math Part 1 I noted that my Wind River Beauty quilt center is 17″. In fact, the block as designed by Toby Lischko finishes at 16″, which is a more typical, or perhaps more useful, size for a quilt block or medallion center. I first built it as a 16″ block according to her instructions, and then I rebuilt the orange surround to finish at the larger size. The 17″ block allowed two things. First, it made the proportions of the block better, once the corner treatment was added. And second, it made the math easier for the next stage. I previously wrote about proportion in three posts (here, here, and here.) In the first post, I covered the proportions of the center block design. In the first picture, the circle is tangent to the sides of the square. The size seems to crowd the square, and may seem “too big.” In the second picture, the circle floats in the square and seems “too little” within a sea of background. The one on the right, to my eyes, seems “just right.” It is still related to the edges of the square while not touching them. For the Wind River Beauty (my name for the quilt,) once I decided to create an octagon of the background orange fabric, I knew it would need to be larger. A slightly bigger block makes more room for the corners, without crowding the inner circle. As shown below, the width of orange is approximately the same as the width of the teal circle. If the block were 1″ smaller, the orange width would be skimpy. Overall, the proportions are better with it bigger. Another reason the make the block bigger is some more quilt math. The diagonal of the square is 1.414 times the length of the side. (See the Pythagorean theorem review in the prior post for details.) The diagonal measure of a 17″ block is 17″ x 1.414 = 24.04″, or just over 24″. Half of the diagonal, or just to the very center of the block, is 12″, which is much easier to work with than the result from a 16″ block. 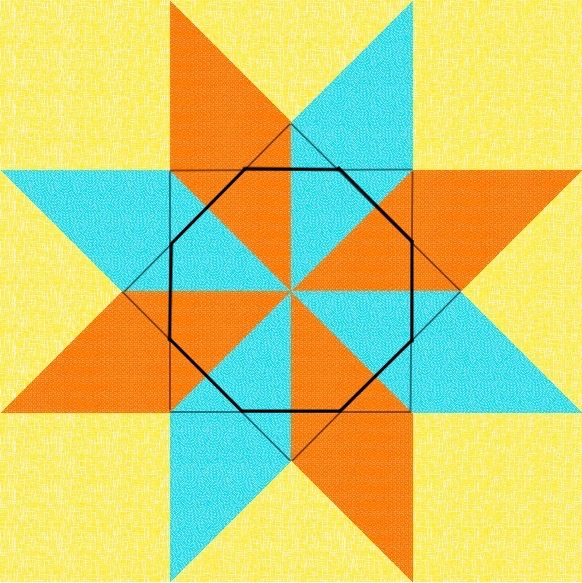 Look at the illustration below of an 8-pointed star. The very fine line draws a square, representing the center block of the quilt. The square is 17″ on each side. The diagonal all the way from corner to corner is 24″. Half of the diagonal, represented by the dotted segment B, is 12″. Each of the star points in orange and turquoise is a 45° diamond. All four sides of a diamond are the same length. A is the distance along the right edge of the turquoise point. A and B are the same length, 12″. With the 12″ length I could build out the star with relatively easy piecing. 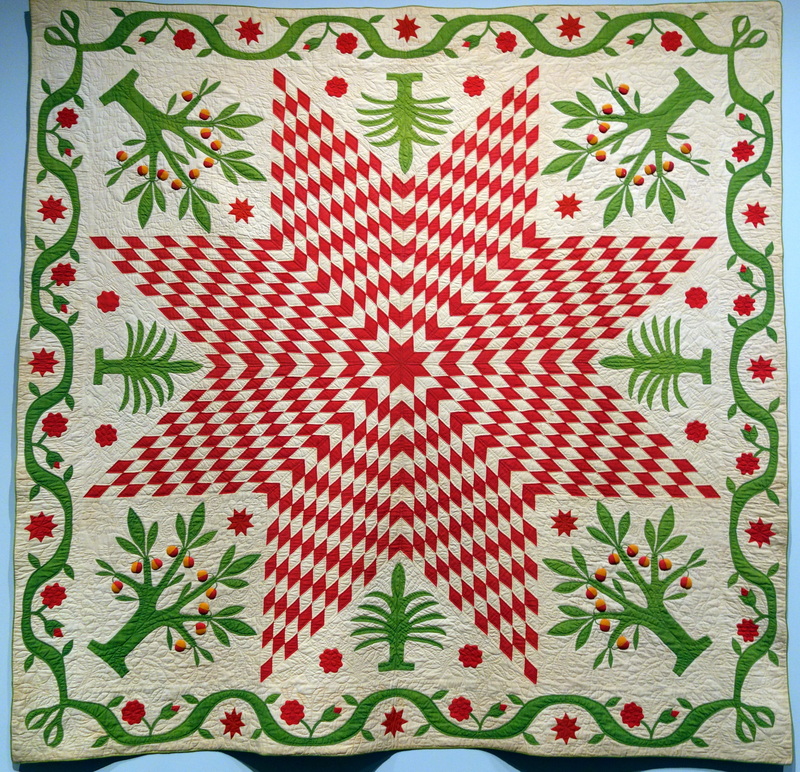 As mentioned before, the design of the quilt is a variation of a Lone Star or Star of Bethlehem quilt. The sketch from EQ8 below gives a glimmer of how this will work. On this picture I drew two squares the same size. One is rotated 45° from the other, around the center point. You might be able to see that the octagon formed by the overlap is marked with a heavier line. If you compare the illustration with my center block above, you can see that the corners of my center block, in purple, are like the corners beyond the octagon. In the next post on this quilt, and past most of the math, I’ll show you next steps for construction. 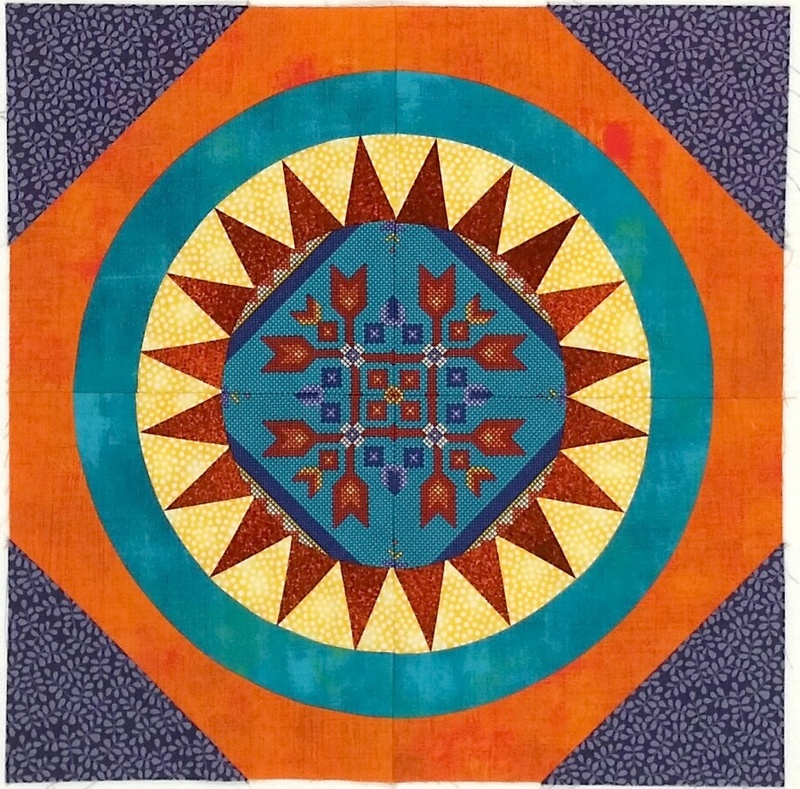 This entry was posted in Medallion Quilts, Quilting and tagged Lone Star quilt, New York Beauty block, Proportion, Quilt math, Star of Bethlehem quilt on January 29, 2019 by Melanie McNeil. This evocative piece is from Burkina Faso, a country with an estimated 70 languages. Even so, with its geometric designs, it speaks the same language as patchwork quilts. It’s easy for me to imagine making a quilt inspired by it. But is it fair for a white woman from midwestern US to mimic symbolism from across the world? I don’t know. In fact, that’s what this post is about: things I didn’t learn in 2018. Two of the most important things about making that I didn’t learn in 2018 have to do with ownership. Who owns the right to create certain objects, symbols, or designs? Answers to this question have to do with both law and ethics. This entry was posted in copyright, Creativity, Quilting and tagged copyright, Cultural appropriation, Cultural misappropriation, Lone Star quilt, Northern Plains quilt, Star of Bethlehem quilt on December 21, 2018 by Melanie McNeil. I’m still working on big-stitch hand-quilting of Untied. It is slow, almost by definition. For the last few weeks, though, I’ve been thinking about a new project, and I finally started it last week. My thinking was inspired by a blogger who used diamonds to create a quilt. (I’m sorry I don’t remember whose blog that was.) Of course diamonds have been used almost as long as patchwork has been around. 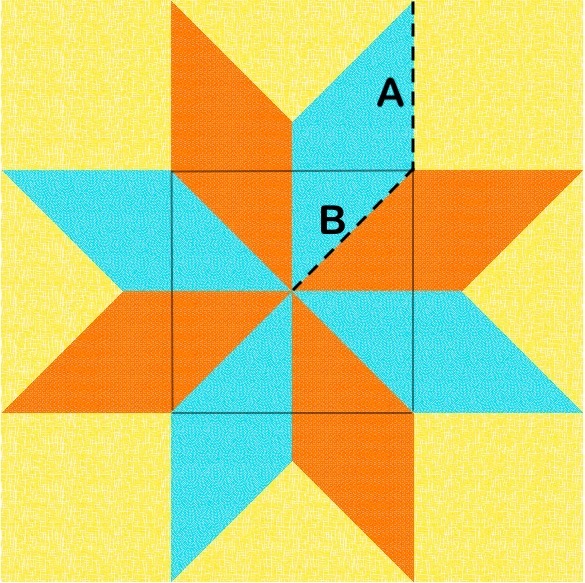 An old configuration is the Lone Star or Star of Bethlehem quilt form. The Star of Bethlehem quilt uses 45° parallelograms radiating from the center to create an eight-pointed star. 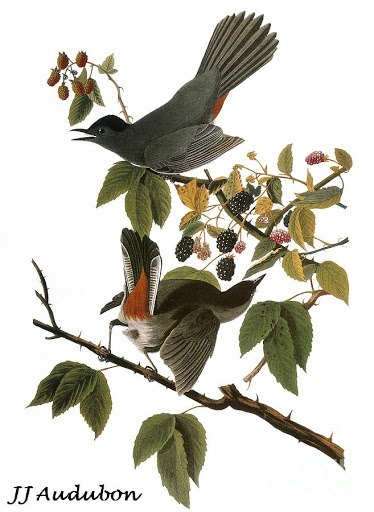 Here is an especially beautiful version from around 1850. 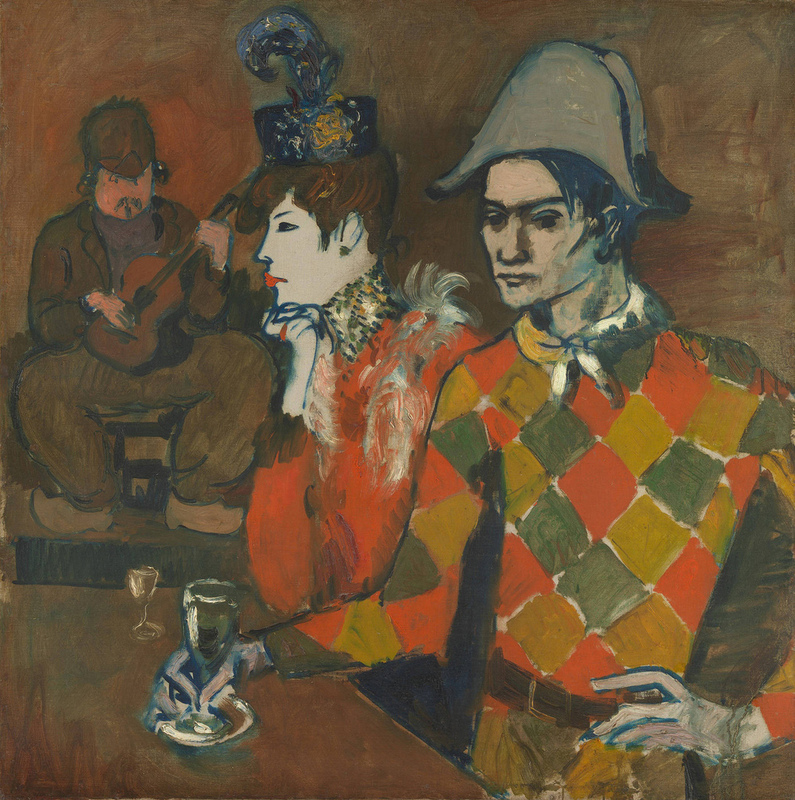 This photo is courtesy of the Museum of Fine Arts in Boston. African fabrics. I pieced the star and appliqued it onto the background. The blog that inspired me, however, didn’t use these patches to make a star. It simply ran the patches in interlocking lines, top to bottom. 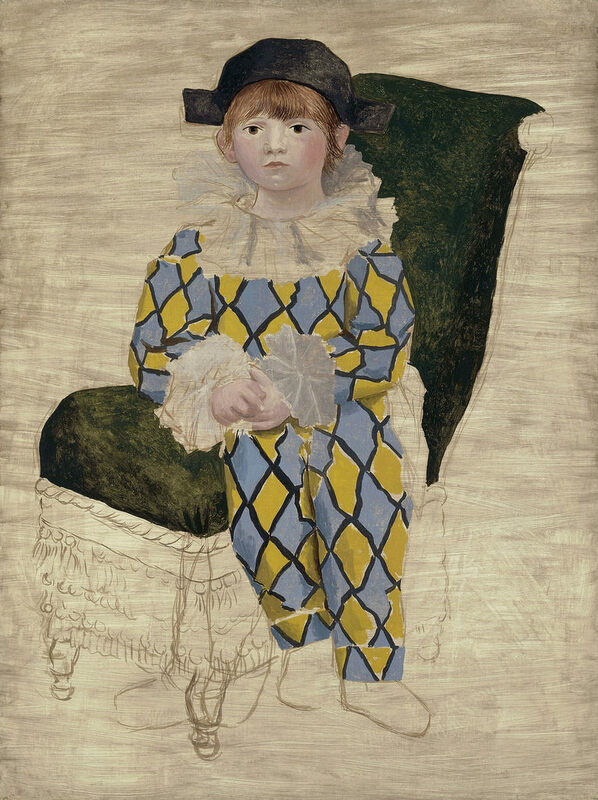 This reminded me more of a harlequin pattern. 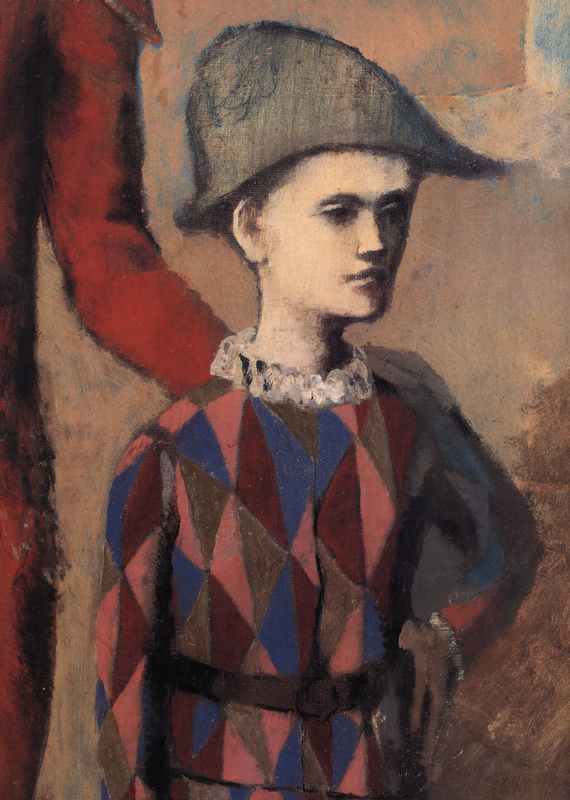 Pablo Picasso painted several pictures of harlequins, pantomimes wearing costumes covered with diamonds. This entry was posted in Creativity, Quilting and tagged 45 degree angles quilt, 60 degree angles quilt, Harlequin, Inspiration, Lone Star quilt, Star of Bethlehem quilt on May 30, 2016 by Melanie McNeil.